Representatives from the IFAD-supported Rural Microfinance and Livestock Support Program (RMLSP) and the Community Livestock and Agriculture Project (CLAP) actively participated in the Spring AgFair held in Kabul, Afghanistan on 20 - 23 March 2016. The agricultural fair is organized biannually by the Ministry of Agriculture, Irrigation and Livestock. The CLAP and RMLSP project staff, in collaboration with implementing partners, set-up an exhibit booth to showcase many of the projects’ activities and achievements in working with poor rural farmers in Afghanistan. A number of government officials, representatives from the donor community, and people working with NGO’s visited and interacted with project staff at the exhibit booth. 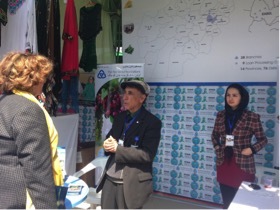 Curious Afghan citizens from across the country stopped by the booth to gain information and interact with project staff. 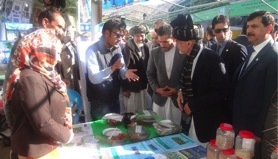 Most notably, Ashraf Ghani, President of Afghanistan, and his delegates visited the CLAP and RMLSP exhibit booth. The CLAP and RMLSP teams briefed the President on the projects’ activities and stages in the implementation process. President Ghani and his delegates expressed their appreciation of the work and especially of the progress that both projects are making in country. Among the activities highlighted at the booth were those focusing on women’s empowerment. 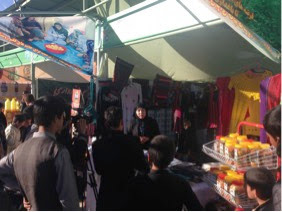 The booth displayed products and information pertaining to women’s production groups, rural microfinance packages, improved crop seeds, dairy and backyard poultry products, and animal health services. As visitors stopped by the booth, project experts and implementing partner representatives provided extensive information and explanations to address all questions. 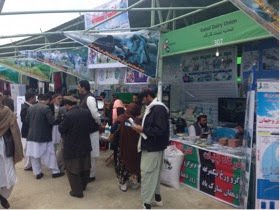 In Afghanistan, the AgFair provides a good opportunity to share lessons learned, best practices, and implementation successes in the agriculture and rural development sector. It offers participants a platform to share their experience with various stakeholders including representatives from NGOs, the private sector, sectorial ministries, and the general public. Similarly, these participants get to know each other, to network, and to exchange ideas with one another. The AgFair is a unique festival where men, women and children can come together to see agricultural products, enjoy live music and entertainment, have a meal and do some shopping. It is hosted by the Ministry of Agriculture Irrigation Livestock and held twice a year in March and October in Afghanistan. The spring 2016 AgFair welcomed approximately 185,000 visitors over four days.